By BV parent, Selena McKinney. The boys ran the rain course which is 2.94 miles and flat. Thank you, Selena, for capturing the excitement. What a race! 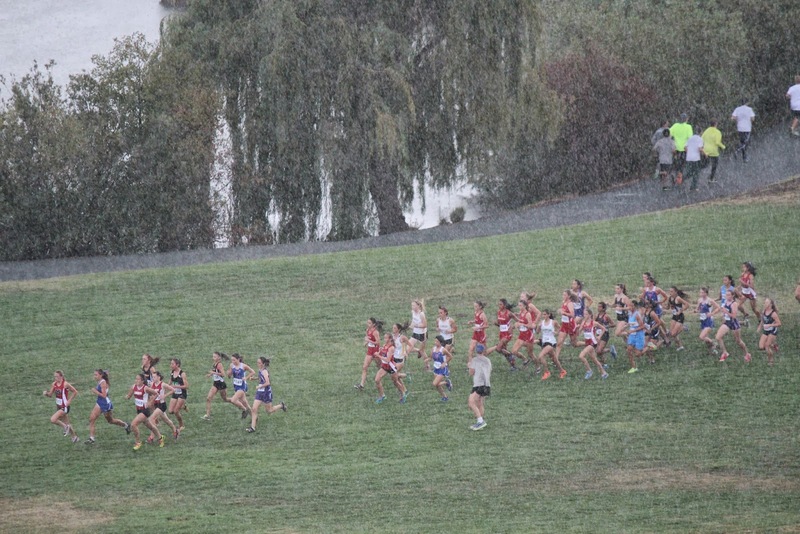 The only thing the video doesn't show clearly is just how hard it was raining while this race was going on. 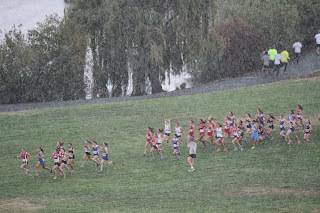 You can't see it well in the video, but it was pouring rain the whole race. Great video. Always amazing to me how slow you are going watching yourself on film. Wow, you got that video with an iPhone?! Great job! I actually don't think any regular video camera can capture the rain very well. It's like the lens just doesn't see it. I think you need to be a Hollywood cinematographer to capture it. You and I were both there and the rain was coming down in sheets. You can't see it on film...you can see some of the rain in your start video, but still doesn't do it justice. Fun race. Hopefully none of those girls who fell were hurt.